Apple Watch had its naysayers when Apple launched it. And it may never achieve the kind of mainstream success of the iPhone and iPad. But in the watch industry, it’s a breakout hit. 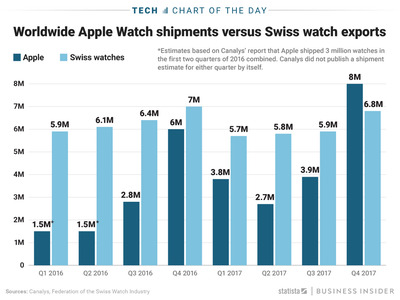 As this chart by Statista shows, Apple shipped more watches during the holiday quarter last year than the entire Swiss watch industry exported, marking the first time the iPhone maker topped the entire export output of the industry’s traditional home. For all of 2017, the Swiss exported more watches than Apple shipped, and the Chinese still make far more watches than anyone. But as the data indicates, Apple is rapidly gaining ground.